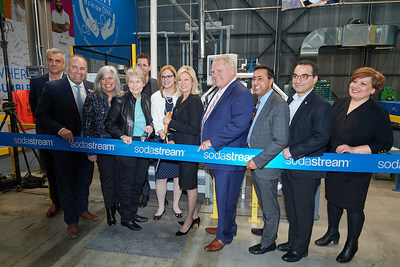 MISSISSAUGA, ON, March 5, 2019 /CNW/ - SodaStream continues to demonstrate its leadership in fighting single-use plastics by opening its first Canadian refilling station in Mississauga with special guest and Honoured Plastic Fighter, Dr. Roberta Bondar. This new high-tech facility is indicative of SodaStream's rapid growth as more and more Canadians look to reduce their use of plastics. In 2018, SodaStream Canada grew by almost 50 per cent and is the fourth largest country in the global SodaStream family, selling 1.5 million machines since 2010. The new refilling centre will be an opportunity for SodaStream to continue to inspire Canadians to fight plastic and ensure they continue to enjoy their favourite sparkling water. In keeping with SodaStream's mission to protect the environment, the new facility will eliminate 208 trips between Toronto and New Jersey annually. "We are thrilled that Canadians have jumped on the SodaStream rocket that is allowing us to invest in a new facility and local jobs. 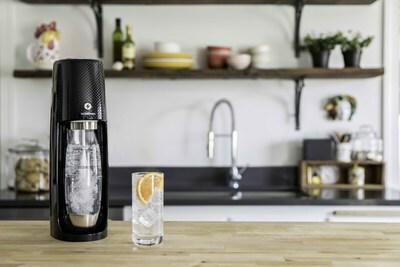 Clearly, we all share a commitment to the environment and a reduction in single use plastics," says SodaStream Canada General Manager Rena Nickerson. SodaStream is also taking the opportunity to honour Dr. Roberta Bondar, the first Canadian astronaut in space and the founder of The Roberta Bondar Foundation as part of International Women's Day celebrations. SodaStream has created limited edition "She Changed the World" bottles to mark the occasion which highlight the achievements of iconic female trailblazers including Dr. Bondar. Dr. Bondar is being recognized for her environmental leadership. "It's an honour to have Dr. Roberta Bondar here to celebrate this milestone. Dr. Bondar's mission is closely aligned to ours to inspire Canadians to protect and care about the environment," says Nickerson.